This standard provides general guidance for the preparation of archival descriptions. It is to be used in conjunction with existing national standards or as the basis for the development of national standards. The purpose of archival description is to identify and explain the context and content of archival material in order to promote its accessibility. This is achieved by creating accurate and appropriate representations and by organizing them in accordance with predetermined models. Description-related processes may begin at or before records creation and continue throughout the life of the records. These processes make it possible to institute the intellectual controls necessary for reliable, authentic, meaningful and accessible descriptive records to be carried forward through time. Specific elements of information about archival materials are recorded at every phase of their management (e.g., creation, appraisal, accessioning, conservation, arrangement) if the material is to be on the one hand securely preserved and controlled, and on the other hand made accessible at the proper time to all who have a right to consult it. Archival description in the widest sense of the term covers every element of information no matter at what stage of management it is identified or established. At every stage the information about the material remains dynamic and may be subject to amendment in the light of further knowledge of its content or the context of its creation. Computerized information systems in particular may serve to integrate or select elements of information as required, and to update or amend them. While the focus of these rules is the description of archival materials after the point at which they have been selected for preservation, they may also be applied at earlier phases. 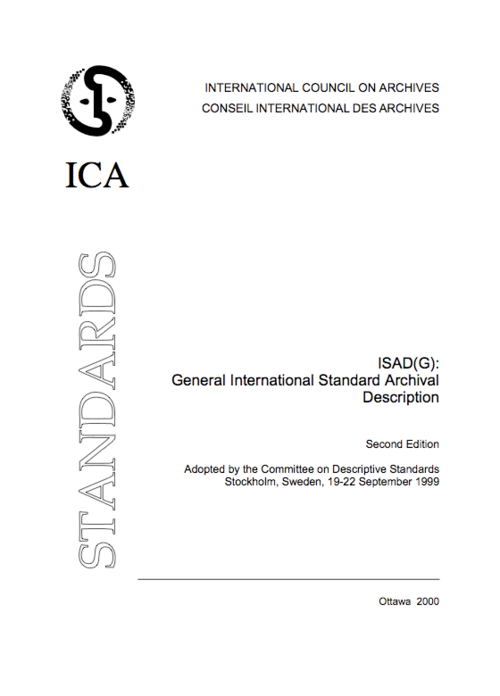 This standard contains general rules for archival description that may be applied irrespective of the form or medium of the archival material. The rules contained in this standard do not give guidance on the description of special materials such as seals, sound recordings, or maps. Manuals setting out descriptive rules for such materials already exist. This standard should be used in conjunction with these manuals to enable appropriate description of special materials. d. make possible the integration of descriptions from different locations into a unified information system. The rules accomplish these purposes by identifying and defining twenty-six (26) elements that may be combined to constitute the description of an archival entity. The structure and content of the information in each of these elements should be formulated in accordance with applicable national rules. As general rules, these are intended to be broadly applicable to descriptions of archives regardless of the nature or extent of the unit of description. However, the standard does not define output formats, or the ways in which these elements are presented, for example, in inventories, catalogues, lists, etc. Archival descriptive standards are based on accepted theoretical principles. For example, the principle that archival description proceeds from the general to the specific is the practical consequence of the principle of respect des fonds.1 This principle must be articulated if a generally applicable structure and system of archival description is to be built which is not dependent on the finding aids of any given repository, whether in a manual or automated environment. In Appendix A-1 one may find a hierarchical model of the levels of arrangement for the fonds and its constituent parts. There are levels of description, with differing degrees of detail, appropriate to each level of arrangement. For example, a fonds may be described as a whole in a single description or represented as a whole and in its parts at various levels of description. The fonds forms the broadest level of description; the parts form subsequent levels, whose description is often only meaningful when seen in the context of the description of the whole of the fonds. Thus, there may be a fonds-level description, a series-level description, a file-level description and/or an item-level description. Intermediate levels, such as a sub-fonds or sub-series, may be expected. Each of these levels may be further subdivided according to the complexity of the administrative structure and/or functions of the organization which generated the archival material and the organization of the material. In Appendix A-2 the model represents the complex relationships between creator(s) and the units of description, regardless of level, as expressed in the boxes representing authority records according to ISAAR(CPF) and the links between them and the boxes representing the units of description of the fonds and its parts. Appendix B shows full examples of archival descriptions and some of its parts. Each rule consists of: a. the name of the element of description governed by the rule; b. a statement of the purpose of incorporating the element in a description; c. a statement of the general rule (or rules) applicable to the element; and d. where applicable, examples illustrating implementation of the rule(s). Paragraphs are numbered and are given for citation purposes only. These numbers should not be used to designate elements of description. Note Area (where specialized information and information that cannot be accommodated in any of the other areas may be conveyed). Description Control Area (where information is conveyed on how, when and by whom the archival description was prepared). Examples throughout the text of ISAD(G) are illustrative and not prescriptive. They illuminate the provisions of the rules to which they are attached, rather than extend those provisions. Do not take the examples, or the form in which they are presented as instructions. To clarify the context, each example is followed by an indication of the level of description to which it pertains in italic and in parentheses. On the next line, the name of the institution that holds the material which the example illustrates and/or supplied the example is indicated, also in italic. Further explanatory note(s) may follow, also in italic, preceded by the word Note:. Do not confuse the indication of the level of description, the source of the example, and any notes with the example itself. The extent to which a given archival description will incorporate more than the essential elements of information will vary depending on the nature of the unit of description. ISO 999 Information and documentation — Guidelines for the content, organization and presentation of indexes. In citing a published source in any element of description, follow the latest version of ISO 690 Documentation — Bibliographic references — Content, form and structure. If the fonds as a whole is being described, it should be represented in one description, using the elements of description as outlined below in section 3 of this document. If description of the parts is required, they may be described separately also using the appropriate elements from section 3. The sum total of all descriptions thus obtained, linked in a hierarchy, as outlined in the model in the Appendix A-1, represents the fonds and those parts for which descriptions were made. For the purposes of these rules, this technique of description is called multilevel description. To identify uniquely the unit of description and to provide a link to the description that represents it. a specific local reference code, control number, or other unique identifier. All three elements must be present for the purpose of information exchange at the international level. Provide either a formal title or a concise supplied title in accordance with the rules of multilevel description and national conventions. For supplied titles, at the higher level, include the name of the creator of the records. At lower levels one may include, for example, the name of the author of the document and a term indicating the form of the material comprising the unit of description and, where appropriate, a phrase reflecting function, activity, subject, location, or theme. To identify and record the date(s) of the unit of description. Record at least one of the following types of dates for the unit of description, as appropriate to the materials and the level of description. Date(s) when documents were created. This includes the dates of copies, editions, or versions of, attachments to, or originals of items generated prior to their accumulation as records. Identify the type of date(s) given. Other dates may be supplied and identified in accordance with national conventions. Record as a single date or a range of dates as appropriate. A range of dates should always be inclusive unless the unit of description is a record-keeping system (or part thereof) in active use. b. the medium of the unit of description. Record the extent of the unit of description by giving the number of physical or logical units in arabic numerals and the unit of measurement. Give the specific medium (media) of the unit of description. Alternatively, give the linear shelf space or cubic storage space of the unit of description. If the statement of extent for a unit of description is given in linear terms and additional information is desirable, add the additional information in parentheses. Optionally, where the unit of description is a record-keeping system (or part thereof) in active use, show the known extent at a given date and/or the extent in custody. Record the name of the organization(s) or the individual(s) responsible for the creation, accumulation and maintenance of the records in the unit of description. The name should given in the standardized form as prescribed by international or national conventions in accordance with the principles of ISAAR(CPF). The Information Areas of ISAAR(CPF) suggest specific informational elements that may be included in this element. To provide information on the history of the unit of description that is significant for its authenticity, integrity and interpretation. Record the successive transfers of ownership, responsibility and/or custody of the unit of description and indicate those actions, such as history of the arrangement, production of contemporary finding aids, re-use of the records for other purposes or software migrations, that have contributed to its present structure and arrangement. Give the dates of these actions, insofar as they can be ascertained. If the archival history is unknown, record that information. To identify the immediate source of acquisition or transfer. Record the source from which the unit of description was acquired and the date and/or method of acquisition if any or all of this information is not confidential. If the source is unknown, record that information. Optionally, add accession numbers or codes. 'To enable users to judge the potential relevance of the unit of description. Give a summary of the scope (such as, time periods, geography) and content, (such as documentary forms, subject matter, administrative processes) of the unit of description, appropriate to the level of description. To provide information on any appraisal, destruction and scheduling action. Record appraisal, destruction and scheduling actions taken on or planned for the unit of description, especially if they may affect the interpretation of the material. Where appropriate, record the authority for the action. To inform the user of foreseen additions to the unit of description. Indicate if accruals are expected. Where appropriate, give an estimate of their quantity and frequency. To provide information on the internal structure, the order and/or the system of classification of the unit of description. Specify the internal structure, order and/or the system of classification of the unit of description. Note how these have been treated by the archivist. For electronic records, record or reference information on system design. Alternatively, include any of this information in the Scope and Content element (3.3.1) according to national conventions. To provide information on the legal status or other regulations that restrict or affect access to the unit of description. Specify the law or legal status, contract, regulation or policy that affects access to the unit of description. Indicate the extent of the period of closure and the date at which the material will open when appropriate. To identify any restrictions on reproduction of the unit of description. Give information about conditions, such as copyright, governing the reproduction of the unit of description after access has been provided. If the existence of such conditions is unknown, record this. If there are no conditions, no statement is necessary. To identify the language(s), script(s) and symbol systems employed in the unit of description. Record the language(s) and/or script(s) of the materials comprising the unit of description. Note any distinctive alphabets, scripts, symbol systems or abbreviations employed. Optionally, also include the appropriate ISO codes for language(s) (ISO 639-1 and ISO 639-2: International Standards for Language Codes) or script(s), (ISO 15924: International Standard for Names of Scripts). To provide information about any important physical characteristics or technical requirements that affect use of the unit of description. Indicate any important physical conditions, such as preservation requirements, that affect the use of the unit of description. Note any software and/or hardware required to access the unit of description. Give information about any finding aids that the repository or records creator may have that provide information relating to the context and contents of the unit of description. If appropriate, include information on where to obtain a copy. To indicate the existence, location, availability and/or destruction of originals where the unit of description consists of copies. If the original of the unit of description is available (either in the institution or elsewhere) record its location, together with any significant control numbers. If the originals no longer exist, or their location is unknown, give that information. To indicate the existence, location and availability of copies of the unit of description. If the copy of the unit of description is available (either in the institution or elsewhere) record its location, together with any significant control numbers. To identify related units of description. Record information about units of description in the same repository or elsewhere that are related by provenance or other association(s). Use appropriate introductory wording and explain the nature of the relationship . If the related unit of description is a finding aid, use the finding aids element of description (3.4.5) to make the reference to it. To identify any publications that are about or are based on the use, study, or analysis of the unit of description. Record a citation to, and/or information about a publication that is about or based on the use, study, or analysis of the unit of description. Include references to published facsimiles or transcriptions. To provide information that cannot be accommodated in any of the other areas. To explain how the description was prepared and by whom. Record notes on sources consulted in preparing the description and who prepared it. To identify the protocols on which the description is based. Record the international, national and/or local rules or conventions followed in preparing the description. To indicate when this description was prepared and/or revised. Record the date(s) the entry was prepared and/or revised. This page was last modified on 16 June 2012, at 08:38. This page has been accessed 40,086 times.